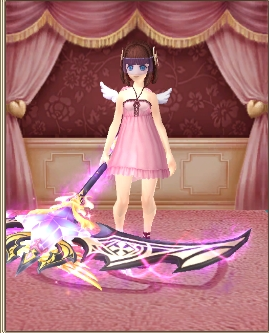 Hi, I'm looking for someone able to help me finding a 2h genki weapon whose color shadings are blue, purple or grey (possible a sword or a sickle/scythe). Could someone tell me few names? I'd need a screenshot to be attached as well, in order to know how the weapon would look in game. Are you looking for something not in the archive? Because it should at least have like 80% of the currently released costumes in there ._. 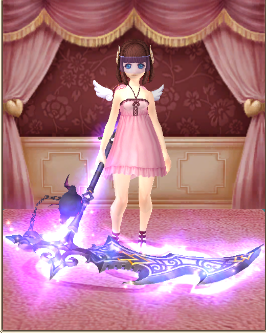 Weapon has a purple hue and the color of the body of the weapon matches your lower half. I don't see any other 2h Genki having both a Blue and Purple theme to it. Sacred Scar Scythe has both purple and grey in it but it has yellow too so that might off-put what you're going for. There are some decent 1h + magic bell kitty (shield costume) combinations that work for that colour scheme, however having a magic kitten on your arm might not be what you want. The biggest obstacle is that your body costume is already in a blue/grey theme and your back is distinctly purple. There's 2h weapon costume with all 3 or even two of those colours in a way that really connects your back, head and body. Testing done on my nub mm dankengine. Looks good! I don't think I've seen that in archive so it must be a newer costume. Anything with that colour scheme for weapon costume would match you well. Grand Fantasia Wikia Item Update incl. New Class Items.